Thomas Monson begins by quoting Joseph Smith's letter to John Wentworth. I love the "Standard of Truth". Boyd Packer says, "neither man nor woman can bear children alone". That's probably not true. For example, read about human parthenogenesis. Packer says we learn more about meaning from our children than our parents. Does God also learn about meaning from us? Hallstrom says, "it's possible to be active in the church and less active in the gospel". Dallin Oaks says we should each offer a "small imitation of [Jesus'] own sacrifice". This is Christ in you. 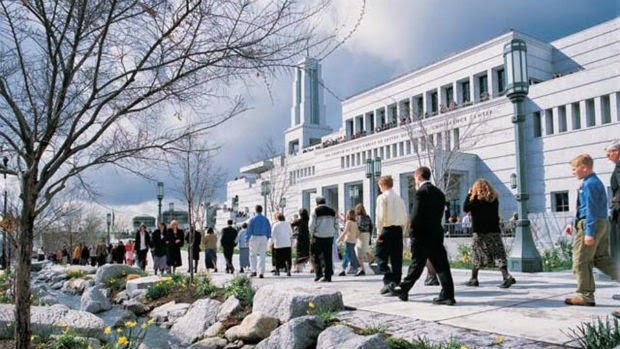 Oaks says LDS Mormons are more generous in time and money than upper 20% of US donors. Oaks says, "we followers of christ must make our own sacrifices". This is Christ in you. Oaks says religion that does not require sacrifice of all can't produce faith for salvation. See the Lectures on Faith. Eyring emphasizes that faith is essential to endurance and progress. Here are my thoughts on that: "Dynamic Faith in Pancritical Rationality". Faith precedes miracles, particularly when we understand miracles in terms of naturalism and technology. Read about Clarke's Three Laws. Carol Stephens (the wife of my friend and boss, Marty Stephens) is the new first counselor in the General Relief Society presidency. "Mingling with Gods he can plan for his brethren". See "Praise to the Man". David Bednar quotes the Articles of Faith, saying ritual administrators are called "by prophecy". Does that make local leaders prophets? Bednar alludes to some of the most powerful words ever preached by Joseph Smith. Richard Edgley says we should work for others' salvation, both spiritual and temporal. Let's engineer a resurrection! We are speaking the words of Christ when we provoke a strenuous mood for compassion and creation. Here's why: we have got to learn how to be gods ourselves! See the King Follett sermon of Joseph Smith. Uchtdorf alludes to another powerful sermon from Joseph Smith. Joseph Smith emphasized the "here" in "hereafter", making this Earth heaven - no escapism. Here and now are the place and time to engineer heaven. Here is how we should understand "prophet". Eyring quotes almost all of these inspiring words from Joseph Smith. Don't you know Joseph Smith prophesied the white iPhone?!? I'm moved far more by appeals to a sublime esthetic than by appeals to duty. Duty is not off the table, but it's insufficient on its own. Why care? Dieter Uchtdorf takes up the subject of prejudices ... and racism? The LDS Church needs to address this subject. Uchtdorf quotes a bumper sticker: "Don't judge me because I sin differently than you." Is Russell Nelson implying an attack on biological evolution? Boo! Nelson says death is part of the plan, but Mormon scripture says death is an awful monster to be overcome. Nelson says death is part of the plan, but Jesus says disciples that won't die are more blessed. The desires of the Three Nephites are different from those of the Nine only in the desire not to die. All want to bring souls to Christ, but Jesus says to the Three: "More blessed are ye, for ye shall never taste of death." Death and hell are not part of the plan. They are the problems addressed by the plan of resurrection and atonement. Does Jesus suggest anything (except not dying) in 3 Nephi 28: 7-10 does not apply to the Nine? Julie Beck says the Relief Society should promote everything Godlike. Not dying enables more good (or evil) than does dying. I think we agree: those who don't die are more blessed because they have more opportunity to do good. Todd Christofferson reminds us that "a prophet is a prophet only when acting as such", and we must discern when prophets are acting us such. Must we be prophets to discern when other prophets are acting as prophets? The simplicity and complexity of belief should correspond to the simplicity and complexity of experience. The simplicity of an idea often reflects the complexity of an intelligence. Tom Perry quotes Mormon scripture describing God's work as immortality and eternal life in worlds without end. Perry says neither the Bible nor the Book of Mormon is sufficient -- and even both are insufficient. Ballard mentions "traditional values", but let's not equivocate between traditional values (eg racism) and good values. Ballard mentions "strong values", but let's also not equivocate between strong values (eg racism) and good values. Ballard appeals to "natural order", but remember death and hell are natural too - we need and want better than nature. Ballard reminds us we're children of God. Vincent Haleck quotes, "where there's no vision, the people perish." That's uncomfortably true. See the New God Argument. Larry Wilson returns to Joseph Smith's inspiring words on compassionate use of authority and the power of compassion. Wilson says wise parents prepare children to get along without them. Does God do the same with us? "Without compulsory means [influence] shall flow unto thee forever and ever." Pieper says the sacred should be combined with the secular. Keep in mind cognitive biases before deciding something is sacred. Neil Andersen cites declining morality, but data suggests increasing morality. Anderson shared a heart warming story of children saved in Haiti, and it shouldn't diminish concern for many children not saved. Anderson contrasts others' opinion of our Christianity with Christ's opinion, but others should be the body of Christ. God bless Mormonism. May we live up to the compassion and creation demanded by our religion.